Blackpink K-pop group’s Kill This Love video sets YouTube record – Royal Times of Nigeria. South Korean pop band Blackpink have set a new record for the fastest music video to reach hundred million views on YouTube, beating a record previously held by another Korean pop star, Psy. According to YouTube, Kill This Love video earned fifty-six point seven million views in its first twenty four hours, and it took two days and fourteen hours to hit the milestone beating the record held by Psy’s Gentleman, the group also broke the record for the highest first-day YouTube views, ahead of Ariana Grande’s Thank U, Next. Blackprint pop band was formed in 2016 with Jisoo, Jennie, Rosé and Lisa as members. The group released their debut album Square One in August of that year which gave them their first number one single in their homeland with the track Whistle. 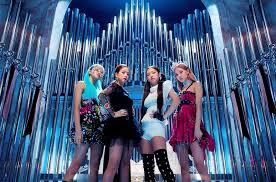 The band became the highest-charting female K-pop act in US chart history with 2018 single Ddu-Du Ddu-Du as the most-viewed music video by a K-pop group on YouTube.